Qualcomm is taking big hits financially over its disputes related to licensing with Apple and market analysts expressed concern. The company posted its earnings for its fiscal third quarter this week and standing out amongst all the numbers were the different legal disputes that have caused revenues and profits to drop. The company’s earnings report was highlighted by a drop of 40% in profits compared to the same period one year ago, with net income for the third quarter falling to $866 million from $1.44 million during the same period in 2016. Revenues were also down falling by 11% to end the quarter at $5.4 billion. Wall Street expected the bad news; nevertheless shares still were down 2% in afterhours trading. Responsible for much of the drop was the ongoing dispute with iPhone maker Apple, which is over the refusal of Apple to pay the royalties charged by Qualcomm on different technologies that Tim Cook the CEO at Apple believes Qualcomm did not have anything to do with and therefore is collecting monies for no reason. This past January, Qualcomm was sued by Apple for $1 billion. It was reported this week that a number of contract manufacturers based in Taiwan, including Foxconn, filed suit in U.S. courts against Qualcomm. Earlier in July, Qualcomm filed suit against Apple for infringement of its patents and has sought an injunction by the court on Apple’s iPhones that allegedly are infringing on Qualcomm technologies. Making things even worse is that another licensee that is unnamed has ceased its royalty payments to Qualcomm. Much of the period of questions and answers with analysts on the earnings call for Qualcomm involved the analysts attempting to find out the length of time the legal battles with Apple and others would drag on, or trying to receive answers regarding who the unnamed licensee was that stopped making payments for royalties. 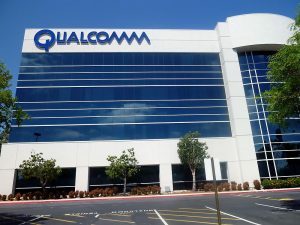 One difficult moment during the call came when one analyst entered a back and forth with Derek Aberle the President of Qualcomm on whether royalty disputes that were ongoing would lead to additional customers stopping their payments to the company. Aberle said the company was attempting to stabilize the regulatory environment which remains a huge priority for the company. He added that Apple has been focused on its agreement and Qualcomm is focusing on getting those issues resolved and added that it does not appear that several other licensees will decide not to pay royalties.